Poetry Reading and Q&A: 7 July 1030 a.m.
43 Inverness Street is proud to announce a partial survey exhibition of the work of Fabian Peake. Covering a span of 41 years, this exhibition fixes upon Fabian Peake’s bold aesthetics and performative content. Paintings, woodcuts, garments, photography, performance, and poetry are included in this tight sampling of Peake’s polymorphous practice. 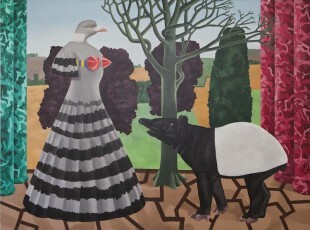 An anthropomorphic wood-pigeon with a red-bra gazes past an inquisitive tapir in the exhibition’s earliest work, The Tapir’s Companion; oil paint on canvas, 1971. The action takes place on a stage set. complete with backdrop and theatrical columns. 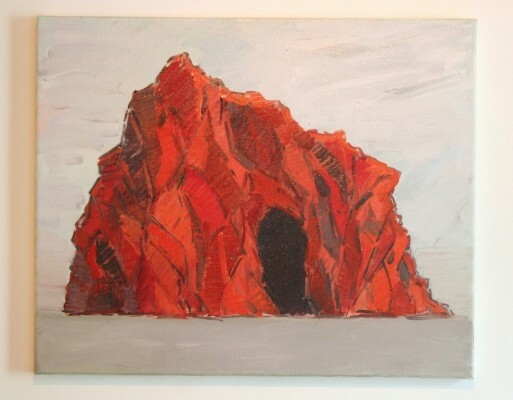 Another painting, Little Mountain, 2010, takes as its subject the familiar early-renaissance stylistic representation of mountains, which are quite like little props, and are often seen in the background of religious paintings. 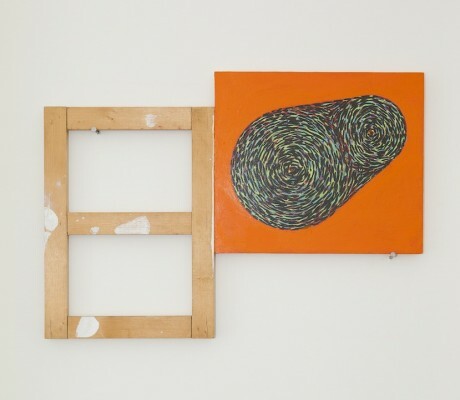 Both works highlight self consciousness and performative staging in painterly representation. 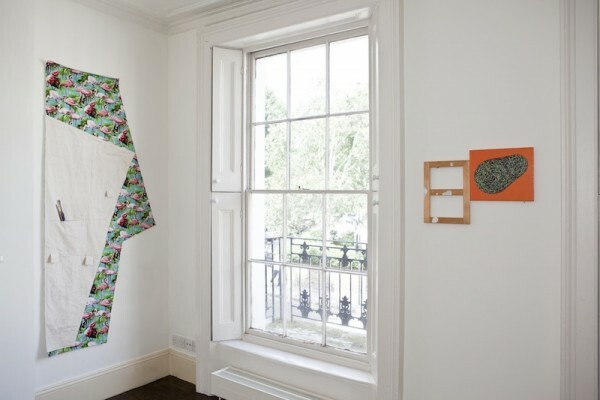 Peake’s quirky aesthetic methods dissect common functional items which are the very material boundaries between public and private, for example, signs and clothing. 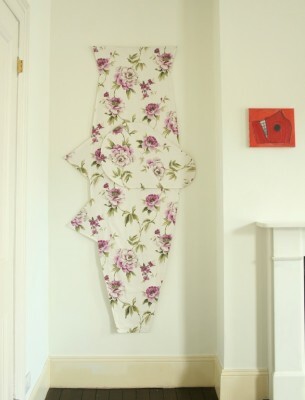 Peake has studied tailoring in order to create a series of works based on clothing construction. 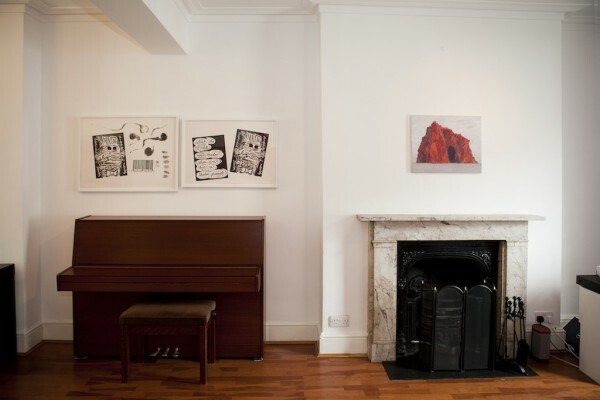 Untitled, a pair of oversized garment-like wall works hang on either side of a fireplace in a kind of double act. In their oddly enlarged and semi-finished state, they manifest a refined performative humour of material relations in the vein of Jacques Tati. 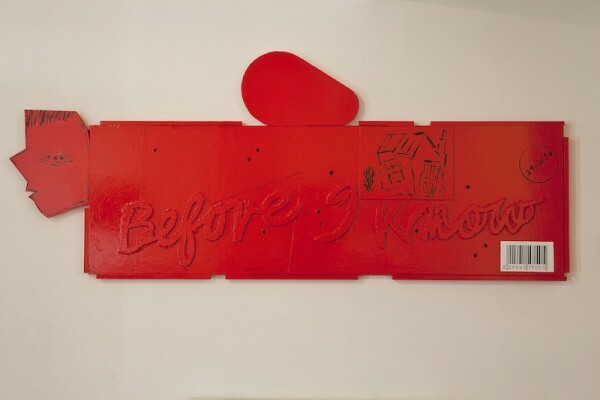 The first work to be encountered in the current exhibition, a sign cabinet, of the type one would see above a shop in London or any other town for that matter, is represented in wood and red paint. But this sign is missing its letters and perspex face and reveals its insides. In reality, this work is a painted monochrome relief. But as such, this work portrays the random-looking guts inside the most ubiquitous of public commercial art. It can be seen as a metaphor and introduction to the exhibition. The exhibition will also feature two black and white woodcut monotypes. 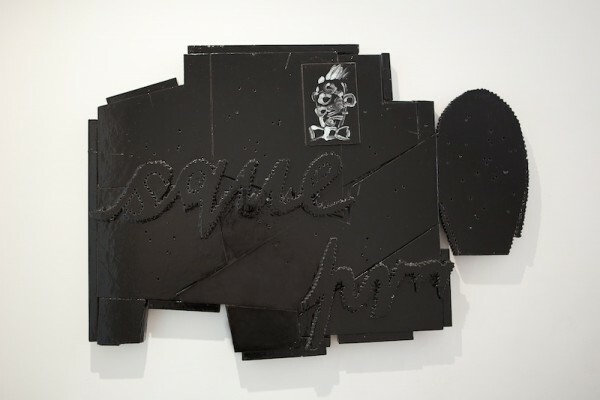 In What do I call your shadow, 2009, The left side of the print asks, ‘What do I call your shadow, when you are a Shadow yourself?’ On the right, a man’s head, roughed-out in woodcut draughtsmanship is surrounded by words of unknowable meaning. The woodcut foregrounds the randomness and absurdity of asking such questions, soliciting an incomprehensible utterance. In an active and mutable dialogue with several mediums, Peakes work is wide-ranging, active and obtuse, but in all manifestations, it always fleshes out the un-straightforwardness that lurks behind the quotidian. Fabian Peake lives and works in London, England. He studied painting at Chelsea College of Art and at The Royal College of Art. 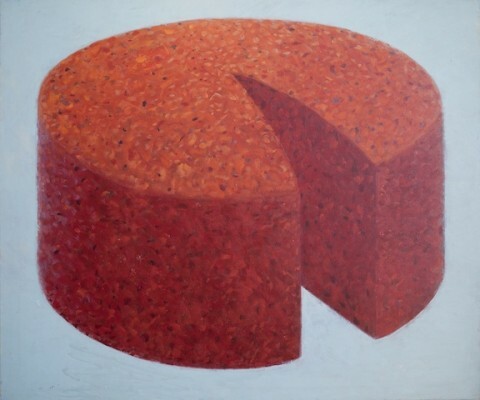 Recent solo exhibitions include ‘Shops, Airports and Blatherskite’ at The Cut Arts Centre, Halesworth, Suffolk, 2011, Fabian Peake at Chelsea Futurespace, London, 2008 and ‘The Suitcase’ at FIAC, Leon, Mexico in 2007. 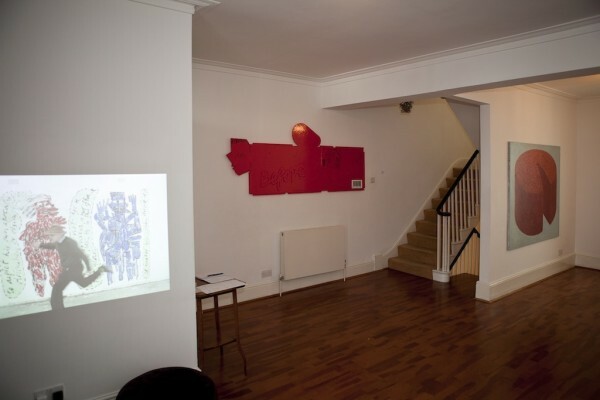 Recent group exhibitions include ‘Ruby’, at Gallery Vela, London. 2012, and ‘Twist’, at Baltic 39, 2012. 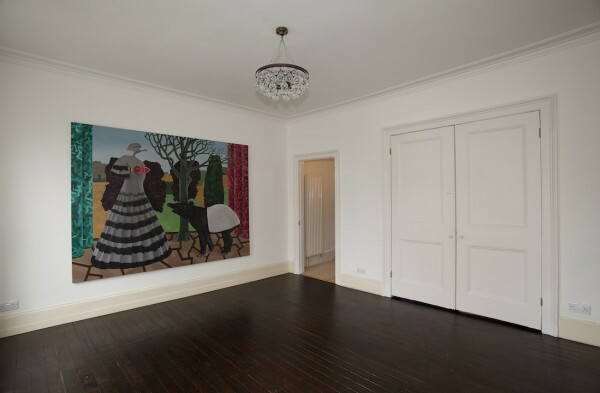 Peake’s work is included in many public and private collections in Great Britain, Europe, U.S.A. and South America. 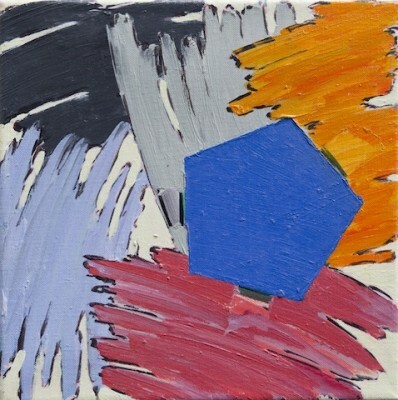 Fabian Peake taught painting as a Senior Lecturer in the Fine Art Department of Manchester Metropolitan University.